You have to hand it to the United Nations, I guess. It’s hard to think of another body that would organise a special meeting on the subject of rising anti-Semitism with anti-Semites not just in attendance, but making speeches as well. 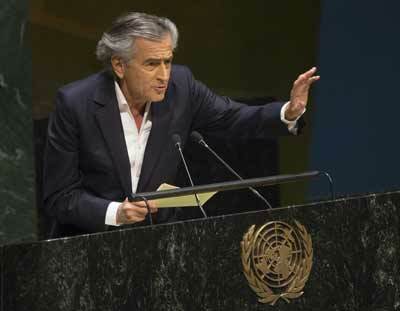 On Jan. 22, French philosopher and writer Bernard-Henri Levy addresses the U.N. General Assembly meeting on anti-Semitism. 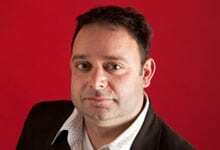 Levy’s message—essentially, that anti-Zionism, the denial of the right of national self-determination to the Jewish people, is the principal pillar upon which today’s anti-Semitism rests—did not get through to the crowd, writes columnist Ben Cohen. Credit: UN Photo/Eskinder Debebe. The Jan. 22 meeting on the subject at the U.N. General Assembly, organised in the run-up to International Holocaust Remembrance Day, started well enough. The keynote speaker was French philosopher and author Bernard-Henri Levy, who used the occasion to mount a forthright denunciation of what he called “the delirium of anti-Zionism.” That he did so from the same podium where the infamous “Zionism is racism” resolution in 1975 was first moved was deliciously ironic, though I can’t say for sure whether anyone else in attendance made that connection, and Levy didn’t point it out. Levy explained that there were three key aspects to the current upsurge of anti-Semitism: the demonisation of Israel as an illegitimate state, the denial of the Holocaust, and what he described as “the modern scourge of competitive victimhood,” whereby Jewish efforts to commemorate the Holocaust are scorned as an attempt to belittle the sufferings of other nations. It got worse, though—much worse. Imagine a meeting about segregation in the Deep South, with one speaker paying tribute to Dr. Martin Luther King, Jr. and another pointing out that these uncivilised descendants of African slaves bore the lion’s share of the blame for the racism heaped upon them, and you’ll have some idea of what the delegate from the Organisation of Islamic Cooperation (OIC)—Saudi Arabia’s Ambassador to the U.N. Abdallah Al-Moualimi—had to say on the topic of anti-Semitism. Nobody walked out or protested (although when I muttered my own disgust, a few people turned around and gave me glaring looks). And this seemed to me to underline Proser’s point: that not only does anti-Semitism stalk the halls of the U.N., but that we expect nothing else. Therefore, I want to suggest an alternative tack. While it would be churlish to demean the efforts of Jewish advocacy organisations and the Israeli U.N. delegation in helping to pull off the meeting, it’s important to recognize that our side of the debate doesn’t have full control of the proceedings, and never will. As long as we fail to control the substance of the debate, and as long as we are powerless to weed out anti-Semites like the OIC delegate from these deliberations, we will never properly explain to the world what anti-Semitism involves. That is what we have to oppose. And so, if there is a future meeting about anti-Semitism at the U.N., or at a national parliament, or any similar body, let’s state at the beginning that the movement to destroy Israel—which spans Middle Eastern governments, Middle Eastern terrorist groups, and assorted Western activists brandishing signs in favour of anti-Israel boycotts—is the greatest concern and the greatest threat.